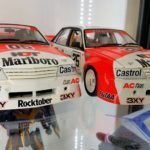 I’m doing a quick review of my Classic Carlectables 1:18 scale 1984 Marlboro Holden Dealer Team Bathurst winning VK Commodore’s. A small bit of info on the VK Commodore and the team. 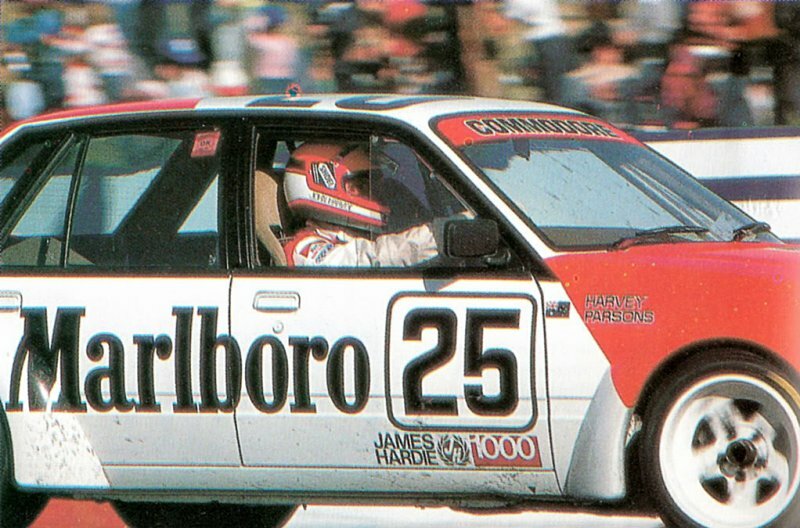 Peter Brock’s HDT or Holden Dealer team was the factory & dealer backed team for Holden and the VK Commodore was new for that model year. Considered a significant leap forward for the model, it introduced more modern looking plastic wrap around front & rear bumper bars to replace the old fashioned chrome plated steel bars of the previous models, enlarged glass area with a rear quarter side windows which gave a more clean modern larger look whilst also improving outward visibility for the driver & passengers. Revised interior with improved dashboard layout & new optional/standard equipment, revised full width look tail light design and a new triple blade front grille. Holden also trimmed down the engine options deleting the 1.9 liter four, 2.85 liter six and 4.2 liter v8 cylinder engines in favor of sticking with the 3.3 liter six (now with optional fuel injection) and the 5 liter v8 engine. 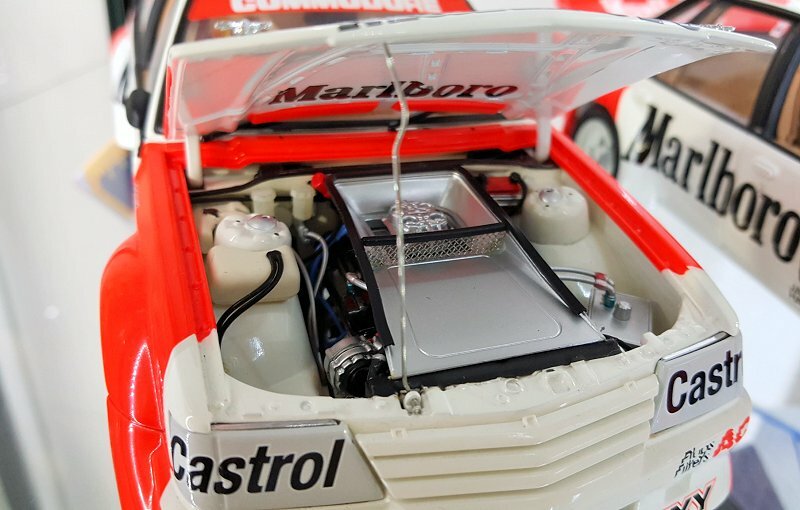 From 1985 the 5 liter (5044cc) v8 was reduced in capacity to 4.9 liters (4987cc) purely for the Group A regulations in order to fit into the “under 5000cc class” enabling the Commodore to run a lower mandatory minimum weight and improve track performance. This may have also allowed the Commodore teams to upgrade their gearboxes from a 4 speed to a 5 speed but I can’t quite remember. Holden Dealer Teams brand new VK Commodores were rolled out just before the endurance events started and were a significant departure for the team in terms of how they built their race cars. 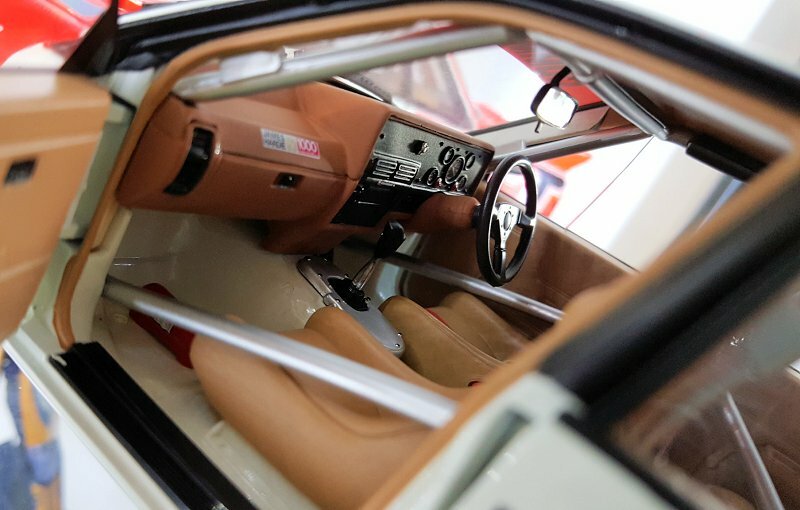 The new cars were far simpler in construction and for the first time had as many redundant parts removed from the car as allowed by the rule book. Also new for HDT was the dayglo paint scheme. 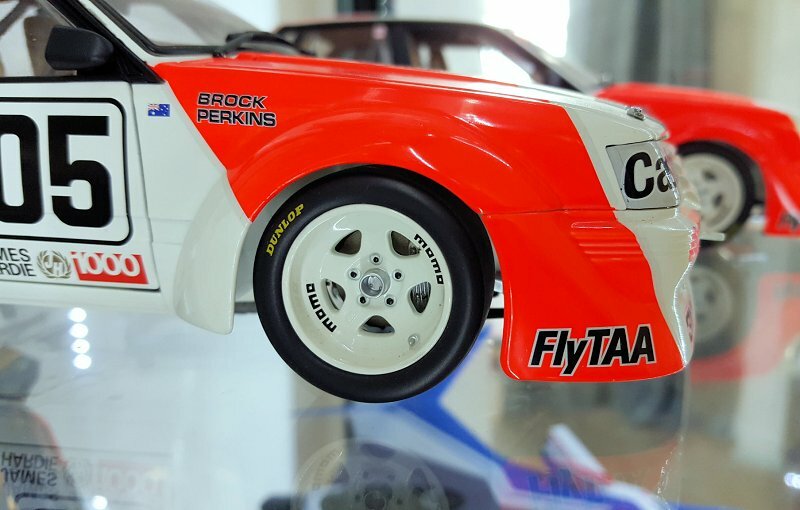 Whilst in Europe Peter Brock noticed the fancy fluorescent paint on another race car and quickly made inquiries into it and managed to bring a sample back to Australia. They managed to get the paint and the new color scheme was born. 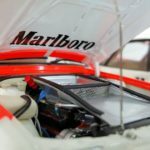 Sadly the new colors would only be present on the teams cars for that last half of the year as the HDT would move away from cigarette sponsorship for 1985 Group A season and on wards obtaining new sponsorship from oil giant Mobil. The HDT VK Commodore’s were successful from the get go with Brock & Perkins winning the Castrol 500 with Harvey & Parsons finishing in 3rd place behind the 2nd placed Moffat & Hansford Mazda RX-7. For the 1984 Bathurst race, Brock & Perkins narrowly missed out on pole position to the Fury & Scott turbo charged Nissan Bluebird. The race started and the Nissan was first into the first corner but the start was filled with drama when the track was blocked by a three car pile up which forced the race to be stopped and restarted. On the restart Brock made a better start and the Nissan lost a few places and wouldn’t threaten for the lead throughout the race, ultimately finishing in 16th place after running into problems. 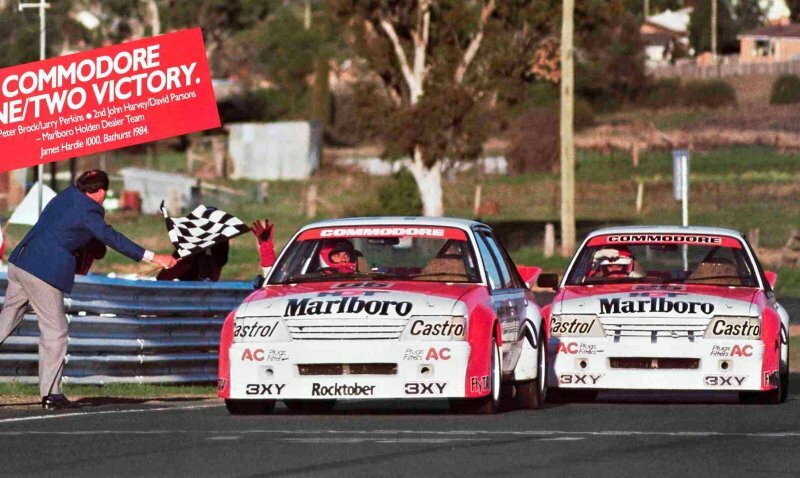 The Holden Dealer Team’s now famous 1-2 finish in the 1984 James Hardie 1000 classic at Mt Panorama Bathurst came after years of trying to replicate Ford’s 1-2 finish of 1977 race and it nearly didn’t happen if it were not for the K-Mart VK Commodore of Warren Cullen & Alan Jones which was running in 2nd place in the late stages of the race when during a quick pit stop to top up with fuel the car’s engine was reluctant to start and they lost enough time for the 3rd place 25 car of John Harvey and David Parsons to catch up and take over 2nd place. The Moffat & Hansford RX-7 also made up ground and moved into 3rd place. The K-Mart Commodore would eventually finish 4th.. 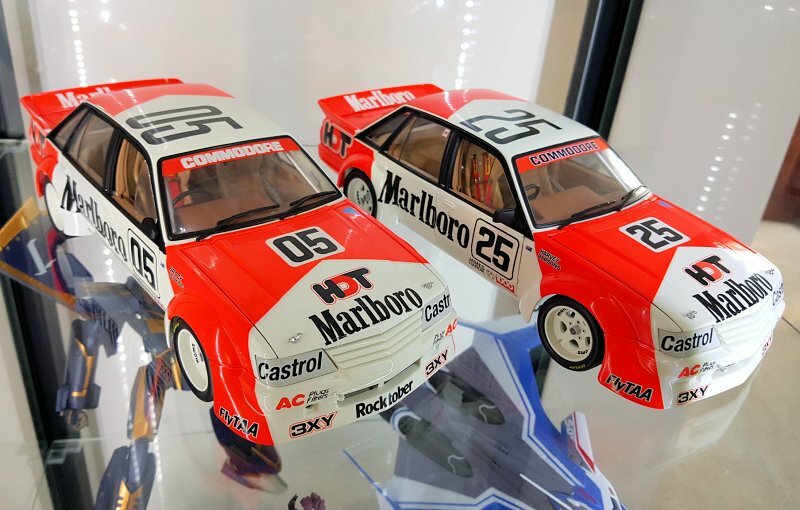 Both Classic Carlectables and Biante have made these two models but it’s Classic Carlectables that have done a far better job at replicating these cars. 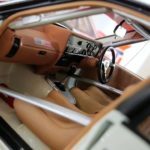 The overall shape and dimensions of the CC cars are far superior to the Biante models which are poorly finished and inaccurately shaped. Yes the CC models do have some inaccuracies but they are far outweighed by the models good points. I did purchase both cars from both brands and have personally owned a VK Commodore previously so I feel I can confidently make that judgement between the two brands. Though I did sell off the Biante models. Side by side the 05 & 25 cars with their fluro color paint both look stunning! My Samsung phone camera simply doesn’t do the color any justice and fails to capture the dayglo red paint effect.. 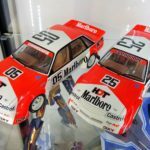 The models do not come with the Marlboro sign writing but can be purchased separately online. 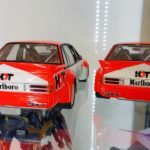 I bought my sticker sets from eBay seller (hotlookstickers) who has gone to great lengths to recreate the stickers as accurately as possible to the actual cars. Each of the real cars has slightly different lettering which they have managed to replicate very accurately. 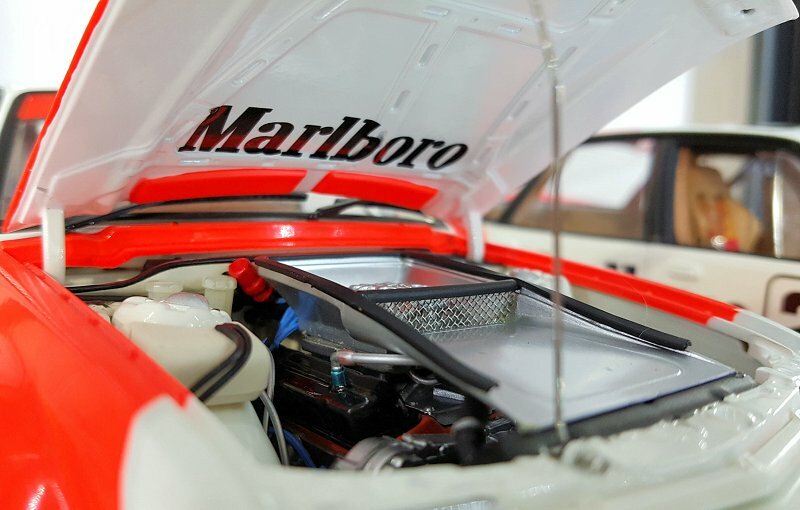 In this photo you can clearly see how the “Marlboro” lettering on the bonnet differ from each other. Other visible differences are the “Commodore” lettering at the top of the windscreen. 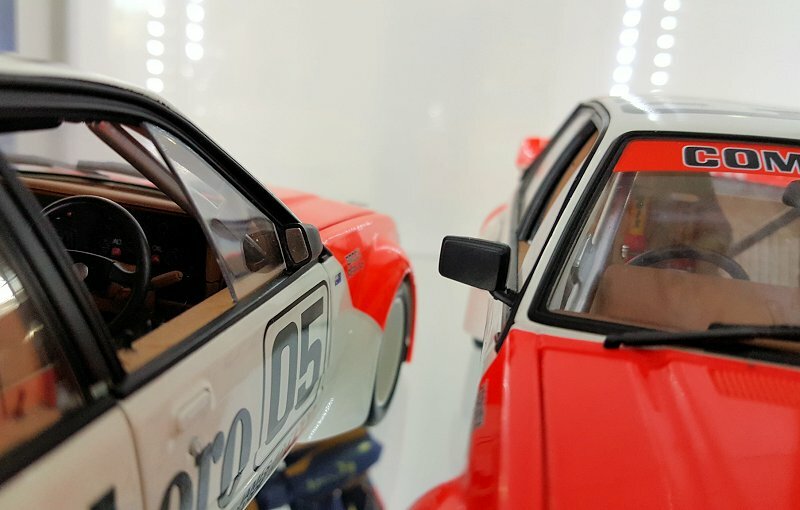 Windscreen wiper arms and blades are molded fairly simply but do look realistic. Front end detail is fantastic and the three blade grille is perforated for that extra touch of realism! Both cars have the tow hook and bonnet pins/latches. The 05 car has “Rocktober” sponsorship on the lower edge of the front spoiler which is also accurate as the 25 did not. The engine radiator is visible through the large cooling hole in the bumper and has nice surface detailing. All the sponsor logo’s feature the correct fonts and size. Here I tried to recreate the 1-2 finish line photo but shelf space was a bit limiting.. hope you like the shot! The Harvey-Parsons car has some duct tape holding the front grille in place as I believe John Harvey was the driver who bumped into another competitor during the race and the grille stated flapping about so the pit crew taped it down.. I have seen photos of the models with the duct tape applied and it looks quite cool! I had thought of doing the same which I might try. 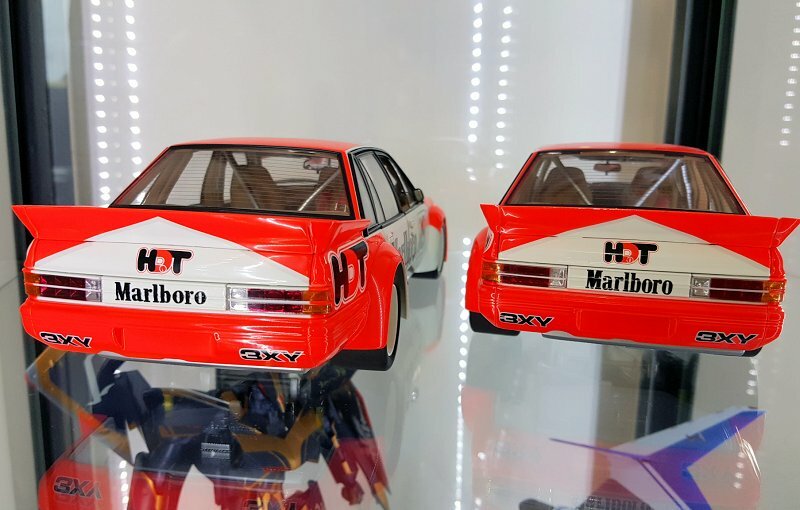 From the rear both cars are pretty much identical apart from the “Marlboro” stickers having slight differences. Again Hotlookstickers have crafted these accurately and the differences can be seen. There is some debate about the rear fuel drop tank shape and color that hasn’t been recreated correctly. 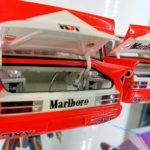 From what I can see from photo’s available on the internet that this is true but they still look good and how I have the cars displayed you can’t see the fuel tanks so its a detail I am willing to overlook. The small semi circle cutout on the rear bumper bar for the standard road cars exhaust pipe tip is accurate as it is there on the actual race cars. 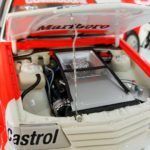 Engine bay detailing is very good on both models. It may look a little sparse but this is accurate to the actual race cars as the teams new build philosophy of less is more is shown here. 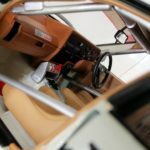 There are minor detail differences between the two cars such as hoses & wiring which I assume was alterations and improvements made to each car during the build process. You can see how the cold air intake ramp is a different color on each car. The reason why I do not know but it would be interesting to find out! 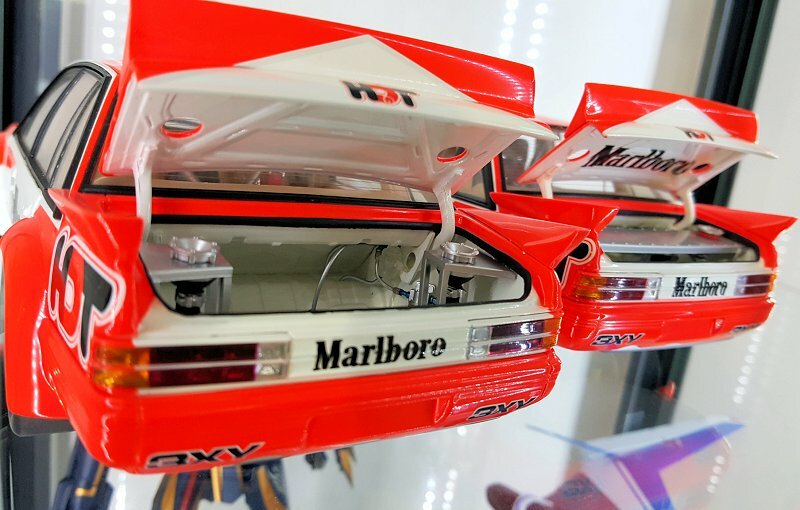 Each car does have the “Marlboro” logo on the underside of the bonnet which is also accurate to the real thing. The models do have the dogleg bonnet hinges but they are quite slim compared to other models I have and seen. Also the real car does have kinda similar style hinges so I’ll let it slide this time. There is also a bonnet support stick! Wheels and tires are recreated beautifully with the white Momo five spoke wheels and big fat Group C race rubber with Dunlop brand markings! The wheel nuts, hub center and Schrader air valve stems are all present and look great! 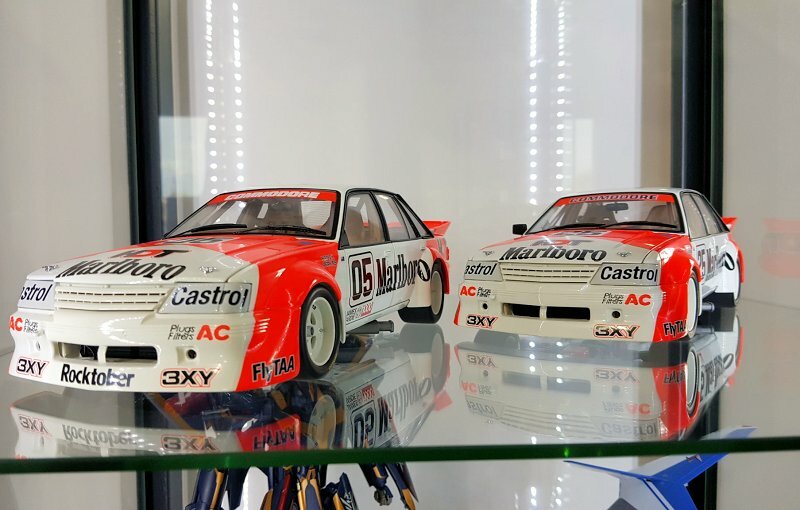 The brake disc rotors and calipers are nicely recreated but im not sure if the disc rotors on the actual cars had slotted grooves cut in them or not. They aren’t visible here but its something I’d have to look into to confirm. Wheel and tire size look to be the correct proportions. Front and rear ride height also looks correct. One of the inaccuracies of the CC models was the drivers side mirror on the 25 car. 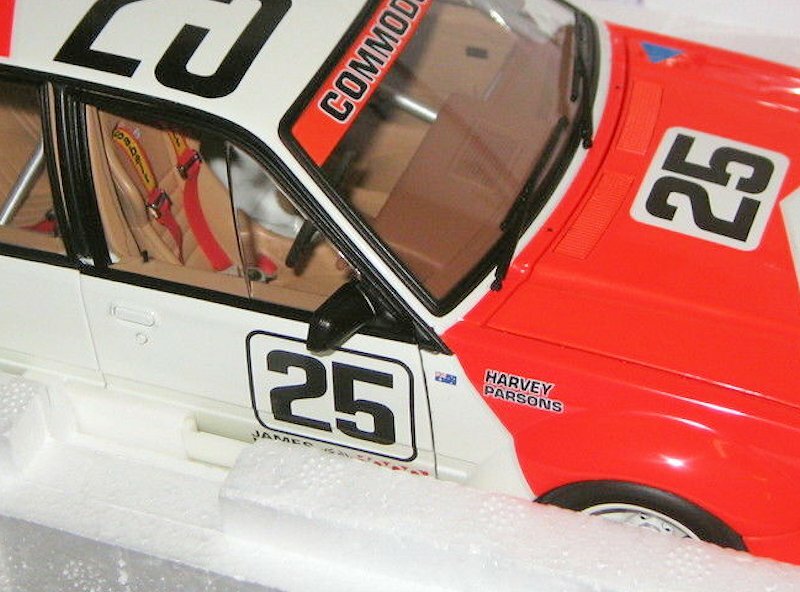 They released the model fitted with the actual VK Commodore side mirror but the Harvey-Parsons 25 car had a mirror fitted from the previous model (VB, VC, VH) Commodores. This bugged me quite a bit and I decided to correct this detail. I found a complete door with mirror from a dismantled CC 1983 VH Bathurst winner on ebay. I was able to carefully remove the original mirror and attach the correct mirror with a tiny drop of super glue. I was quite pleased that I was able to correct this minor but irritating error. Just thought I’d mention that the Biante model did in fact have the correct model fitted. Why or how CC missed this detail and Biante did not is a bit of a mystery to me as it would have been an easy thing to notice during the development stage. 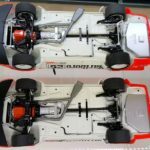 Below are photos showing the 25 car with the incorrect mirror and the actual 25 race car with the correct older style mirror. The two cars did in fact have different side mirrors as Brock preferred the smaller aero style mirror and Harvey preferred the older standard issue mirror. I still find it funny that CC went to the effort of fitting the correct mirror on the 05 car but made no effort doing so on the 25 car..?? Tisk tisk CC. Lucky this was and is a very easy fix so you’re forgiven! 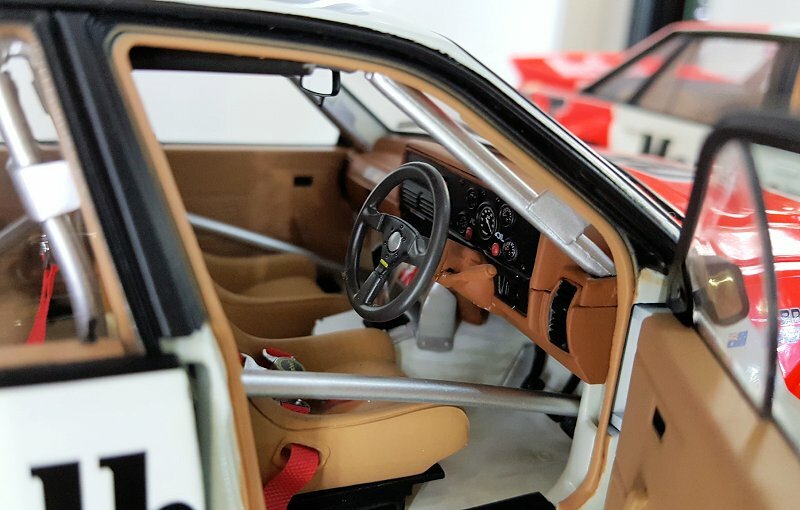 Interior detail on both models is very good. There are minor differences between them, one of which being the switch box present on the 05 but not on the 25 car. The switch box has some switches including the main kill switch but these switches are no where to be seen on the 25 car which is a bit strange as any race car should have one somewhere yes? I have never seen both the real cars side by side to confirm this particular detail so I cannot make a final judgement about it. 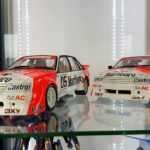 There is an 05 car at the Bathurst motor sport museum located next to the track but there has been an ongoing debate as to whether or not it is the actual 05 car or the 25 with the race numbers swapped. 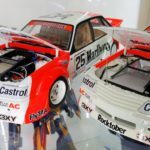 The rumor is that the John Clelands father wanted to buy the Bathurst winning car but Brock wanted to keep it in Australia so the team swapped out the numbers and sold them the 25 car instead but this is something that have never been confirmed. 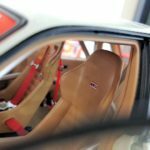 The car which was sent to England was brought back by Peter Champion and restored to the original 05 colors but its still not 100% known if that is the actual Bathurst winner or not. I would say Peter Brock did know but some say not even he was sure after all those years. Perhaps Peter did know but took it to the grave with him.. oh well. The other difference between the two cars are the front seats with the 25 car has the team emblem printed on the back rests and the 05 car does not. Other than that the interiors are the same. 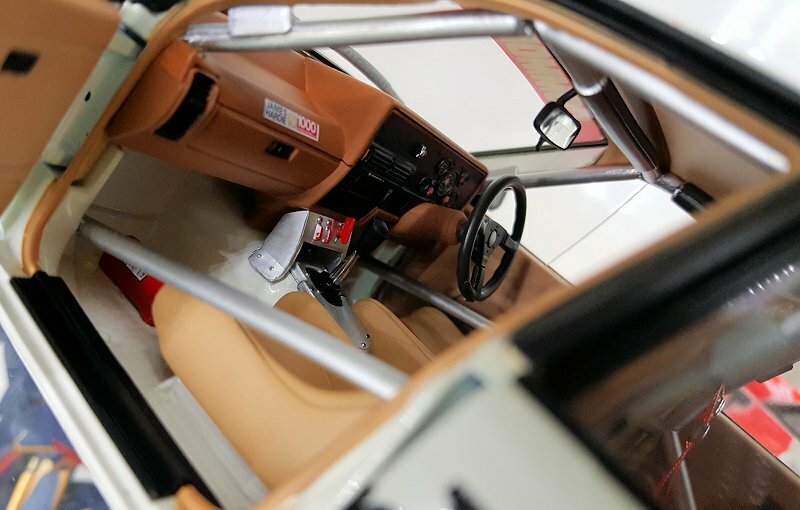 To be honest I think I prefer the slightly more simple 25 car interior without the switch box.. Both cars have real material seat harnesses and very nicely done (though a little large) belt buckles. 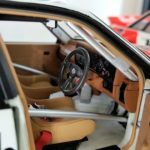 The Momo steering wheel and dashboard are nicely done and detailed. 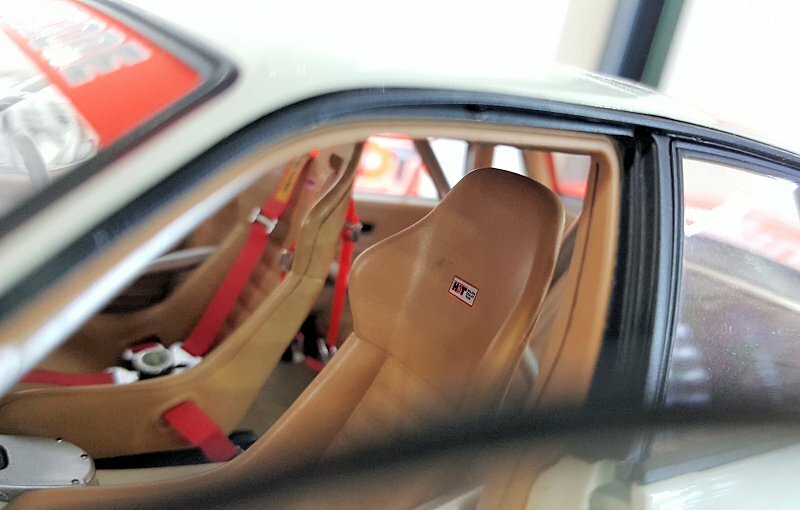 Boot compartments are nicely and individually detailed on both cars. 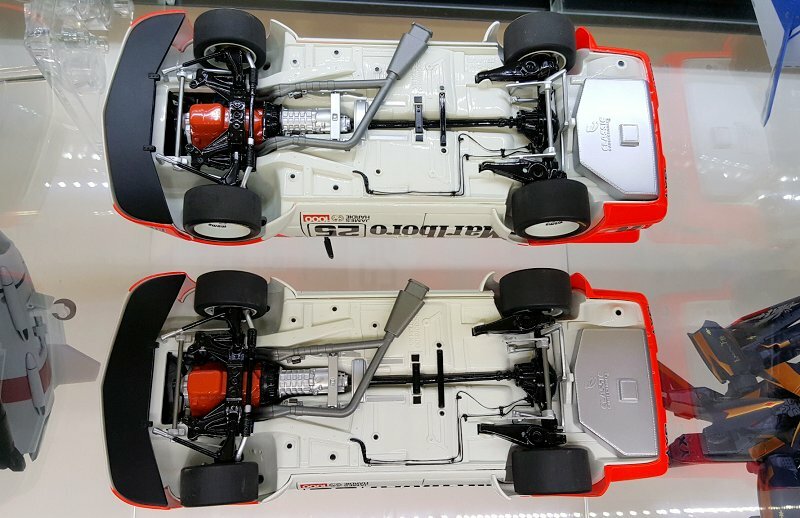 Again why there is a difference between the two cars is unknown but you can see the filler support bracing is designed quite differently for each car. Maybe during production they found a better way to mount the dry break filler necks and save weight perhaps? Of course this is a pure guess but it would be very interesting to find out why this happened. You can also see in this photo that the Marlboro logo is missing from the underside of the boot lid on my 05 car.. this is only due to me damaging the sticker beyond being usable and I wasn’t able to apply it. I did however purchase another set of stickers but never got round to fitting the missing sticker. And now I can’t even find where I put the stickers so I’ll have to buy another set! The under body detailing is well executed and pretty much identical on both cars other than what appears to be the rear sway bar painted a different color on the 05 car for what ever reason..? Tires have staggered sizes correct to the real cars and there is semi functional suspension! Some parts of the suspension do move with the wheel and all components are detailed very nicely! The rear axle even has the correct watts linkage design which the race cars were allowed to run even though the road cars had a pan hard rod axle setup. I believe the reason for this was the standard suspension setup proved insufficient for track duty and the motor racing governing body at the time (CAMS) allowed the Commodore teams to run the watts linkage setup. 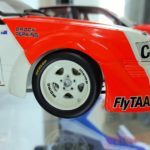 I believe the Ford Falcon teams also had issues with the standard suspension setup with their 1982-84 XE Falcons and were allowed to alter the upper and lower trailing links in order for the suspension to work correctly on the race track. Back to the model.. The watts linkage center pivot isn’t mounted directly to the diff housing like it should be but I’m sure it could be glued into place for those who are super fussy.. Personally I’m fine with it. The Front wheels do steer about 20 to 30 degrees which isn’t much but considering how fat the tires are this is fine. Final thought? 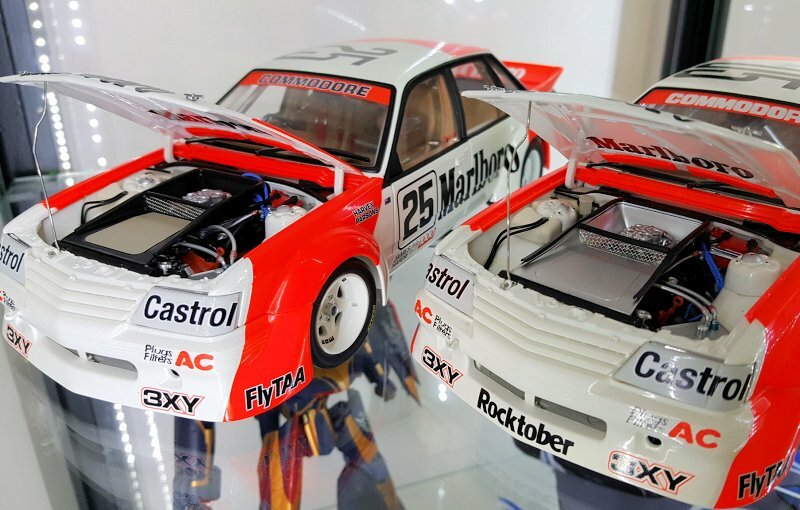 Well these models are very well made and are some of my absolute favorites in my collection as I have always been a huge fan of the Australian Group C acing era! 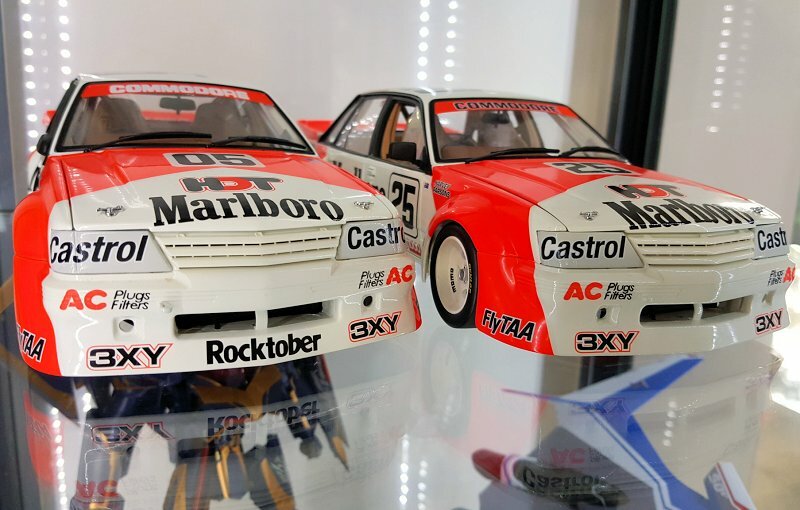 I can easily recommend these models to anyone even if you don’t collect Holden’s or anything from the Australian motor racing scene for that matter. They are still available quite cheaply on eBay even though the 05 car is a Bathurst winner! I have seen them sell on eBay for less than $200 (AUD) which is a smashing bargain! 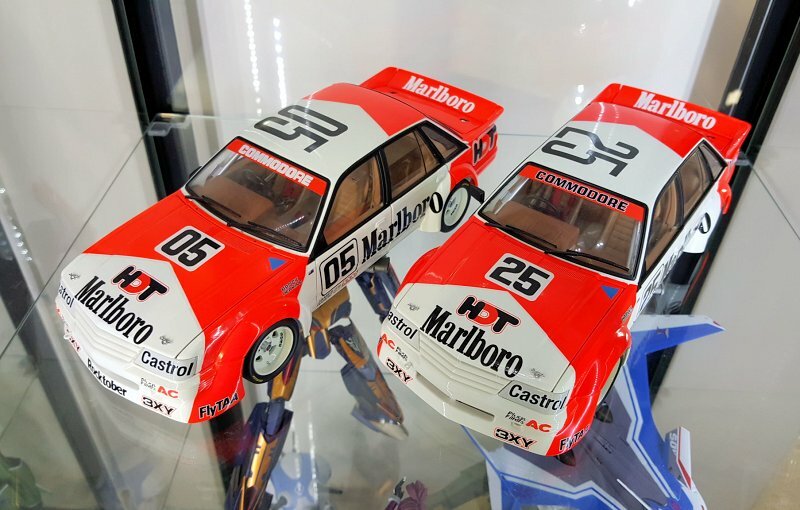 Some with the Marlboro stickers applied! And the 25 car for even less than that! 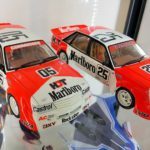 2 Responses to "REVIEW: Classic Carlectables Bathurst Marlboro Holden VK"